Buying gifts for your family and friends can sometimes be a tricky task. But if they, like you,are an optical illusion enthusiast, then we have a list just for you! Have a look at these really cool gifts that are optical illusion themed and are guaranteed to be loved by whoever receives them. Optical illusions and magic card tricks are a match made in heaven since so many card tricks rely on sleight of hand which is an optical illusion in its own way! So why not put these two great things together with this amazing optical illusions deck of playing cards. Each card has its own, different optical illusion on it. Whether you use them for magic card tricks or playing card games, you will have a great time. If you like playing card games then you should have a look at Red Flush online casino games where they offer various cool casino card games such as poker and blackjack. As a new member to the site you will also be awarded a new player welcome casino bonus of $1000. This coffee mug is so cool! 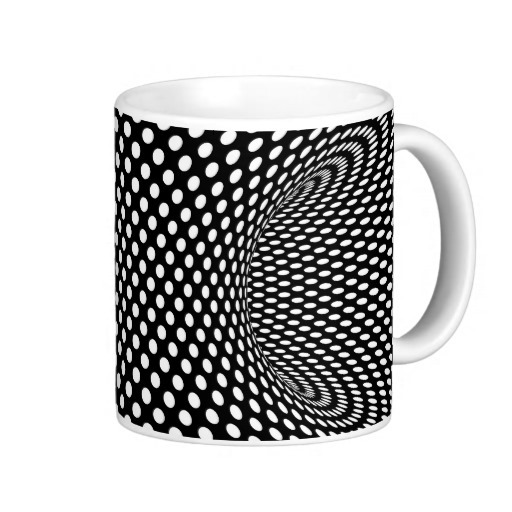 The optical illusion spatial geometric design of this coffee mug makes it look as though it is concave on the one side. But do not worry, it most certainly is not! You will still get the full cup of coffee you need to wake up fully. And once properly awake, you are sure to appreciate the design of the optical illusion even more. For a cool gift idea, pair this mug with some imported coffee beans or artisanal hot chocolate so that you friend has something yummy to put inside immediately! Now this is a gift for the fashion forward friend in your life. It’s simple, yet stylish. Buy them a T-Shirt with the famous rabbit or duck optical illusion taking center stage. This can be bought online at Zazzle in a variety of sizes and colors. If you think your friend would prefer a T-shirt with a different optical illusion on it, there are many others that you can buy online—just search the web! And if you do not find what you are looking for, you can always go to a screen printing T-shirt shop or buy your own iron-on T-shirt transfers and make one yourself! Why not give your friend or family member an optical illusions gift in the most pure form: A print-out. But no, I am not talking about a lazy A4 printed copy from your home printer. Think bigger and better, my friends! Most places where you can get photographs printed from a USB, will also give you the option to have it printed on a canvas for a little extra money. You can get canvases in a variety of sizes too. This really takes the illusion to the next level and makes it look super professional.